Designed for storing biological material, human or animal cells, at temperatures as low as -196 °C (but should be used only in the gas phase of liquid nitrogen). The cap features a long skirt for easy one hand aseptic methods, the same super fast thread design allowing it to be removed or sealed with a mere 1 1/4 turn, and the same inside thread design that will not contribute to possible contamination. But this cap also features an exclusive silicone seal fitted inside the cap to ensure a positive seal at any temperature, even the lowest of cryogenic temperatures. Please note that model T310-10A has a polyethylene screw cap. 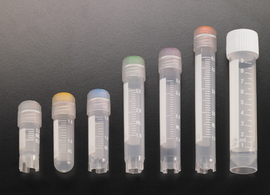 Tubes are provided with a white marking area for sample identification and can be color coded by the use of a CAPINSERT™ (Series T312). The Econo-Lab cryogenic tube is compatible with most storage systems. T310-2 can be centrifuged up to 17,000g. Vials are sterilized by gamma radiation and are packaged in unique tamperproof, resealable, safety-lock bags of 100. Autoclavable.